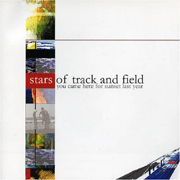 Stars of Track and Field's self-titled debut seemed lackluster. However, the Portland, Oregon-based outfit makes up for it on their latest, the You Came Here for Sunset Last Year EP, a five-track collection of electro-infused, graceful pop songs. Semi-lush and mid-tempo, the songs float like fluffy clouds before hitting you with an unexpected hook - or two - reeling you into their late-nite-meets-dawn atmospheric rock sound, giving the stumbling drunk and blurry eyed a refreshing sound to relax too. Indie rock elitists will enjoy the band, too, as the five songs, which span a mere nineteen minutes, possess enough coolness and indie sparkle to make the jaded enthused again. Well-polished pop meets indie-hipness in a sound that is sure to help propel this band soon enough. Still, the songs are strong enough you want more than five. I'll give it a B.